Wallace's novel was subtitled "A Tale of Christ" and this film was produced by Mark Burnett and Roma Downey, who turned Burnett's success with reality TV into a shingle devoted to making movies with a Christian content pronounced. 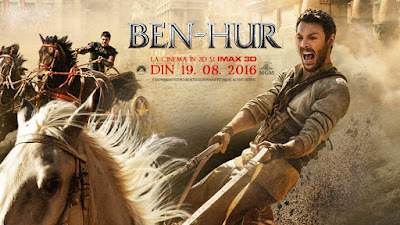 Therefore, this "Ben-Hur" has more Christ than any previous version. And a lot of philosophizing in the dialogue. "You confuse peace with freedom," says a character at a certain moment; to another the ideal of a "civilized world; Progress, Prosperity and Stability "is uttered, which sounds like an establishment for a dismantling of secular humanism. When we see him for the first time, Jesus (Rodrigo Santoro) sculpts wood, and surprising a conversation between Judah and his future wife Esther (Nazanin Boniadi), he warms up slowly, "Love your enemies." "Love your enemies . ? It's very progressive, "Judah replies, and soon, when he is stripped of his house and family and enslaved to a galley ship, he will have the opportunity to return these words. The characters all speak in a completely contemporary tone, which shows the influence of - what do you know? - "The Last Temptation of Christ" from Scorsese, who has been criticized for (among other things) having the Apostles speak as if they had just jumped out of the IRT. It's not particularly embarrassing, it turns out. In the net plus department, once the action is launched, it's pretty good. The naval battle in which Judah escapes is a very effective action, one of those scenes that forces you to exhale when everything is over. It's frenetic and noisy, but not particularly exaggerated, which is unusual for Bekmambetov. The relatively moderate violence is also unusual - there is a lot of brutal behavior in the picture but its representation is relatively limited, another first for its director, whose work in the likes of "Night Watch", "Day Watch" and the abysmal "Abraham Lincoln: Vampire Hunter" lacked many valuable qualities, the shade being one of the largest. I have to credit Burnett and Downey here; Obviously, they pledged to keep the film as "family-friendly" as possible. The chariot race, too, is both fully watchable - no bones are cracked, and many could have been - and consistent. Lead actors Huston and Kebbell both do very credible work, although in the first incarnation of Judah Ben-Hur, Huston looks a bit like Jimmy Fallon making Barry Gibb. And at some of their moments of relaxation, Huston and Kebbell seem to get off the set and go to Sleaford Mods. Does the film radically reorganize both its source material and the most famous adaptation of this material? It's sure like hell. But I doubt that many contemporary viewers regard any of these texts as sacred writings. This is a "Ben-Hur" of and for his time, but also a little better than his time, it turns out. I'm not qualified to say if it's an effective delivery system for his Christian message, but I think I can credibly say it's a good popcorn movie.